Arthur Joseph Nitti was born in Brooklyn, New York on October 18, 1925. 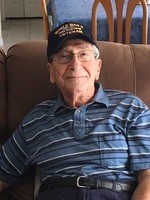 A highly decorated WWII veteran, Dad returned home to continue serving his country as a defense contractor. Of all the many accomplishments he attained, perhaps his most noteworthy was being one of the technicians that designed our country’s first radar missile tracking system. His intellect was crystallized in the depth and diversity of his knowledge base which was evidenced in his constant hunger to learn from every possible source. Devouring books containing the most complex of subjects, he epitomized the adage that true knowledge is self-made and reflected by the letters that stand behind a man’s name. Arthur met the love of his life, Katherine, Married on June 23, 1951, and would dedicate their lives to loving each other for 66 years. They were blessed with six extraordinary children that became the keystone of their lives. Having raised their children, Artie, Deborah, Richard, Marc, Karen and Elizabeth in New Hyde park, New York, Arthur and Katherine moved to Melbourne, Florida, where they would spend the rest of their lives loving each other and being blessed with Jennifer, Paul Michael, Sienna, Dominic, Michelle, Kris and Lena as grandchildren; and Parker, Mason, Matthew, Michael, Katherine and Karen, as great grandchildren; and their son-in-law’s, Paul and Duane; daughter-in-law, Mary. As a man, Arthur embodied all the qualities that our Lord asks of us. His humility, honesty, integrity and faithfulness to his family and all those lives he touched could only be exceeded by the genuine and pure nature he made every decision with. He was the benchmark for everything that is good in this world and the defender of all we need to live a just and peace-filled life. He was, and will always be, the standard for all those that which to bring this world true love, peace, joy, laughter and immovable resolve. He, above all, was one of the few that will ever walk the face of the earth that made this place better, just by being in it. To send flowers to the family of Arthur Joseph Nitti, please visit our Heartfelt Sympathies Store.